Real estate investors fill an important role in the real estate market. Investors are not like your typical homebuyers. While homebuyers are looking for a place to set down roots, investors are looking for properties that can make them money. This can make the selling process very different than the typical real estate sale and you should be prepared for what to expect when working with a real estate investor. What Role Do Investors Play? Investors see the market very differently than traditional homebuyers. That’s not to say that homebuyers don’t see real estate as an investment. However, most homebuyers are thinking long term and may be willing to wait years before they see any profit from their investment. Investors put down their money with the aim of making their money back more quickly. Some investors will renovate homes for a quick sale, also known as “flipping.” Other investors may look for properties that appeal to renters. Whether they are flipping houses or looking for rental properties, investors add much-needed liquidity to the real estate market. In most cases, real estate investors have the funds on hand to purchase property. This means that their participating is often not dependent on securing financing or selling other properties in order to find money for a purchase. In a slow market, investors can keep things moving. In a hot market, the mere presence of investors can help sellers secure better offers with fewer conditions. Finally, since investors usually have funds on hand, they offer a fast sale solution for sellers looking for a quick closing process. Sellers who are moving, in financial difficulty, or had a previous sale fall through may be looking for a faster sale process than what is usually considered normal. This is where investors can step in and help. Working with a real estate investor sounds great but the real question now becomes how to find investors to buy your home. While investors often have their finger on the pulse of what is happening in the real estate world, they aren’t omnipotent and there are some ways to get the attention of investors if you are looking to sell. Here are some of the top ways to find real estate investors. Banks are essentially large institutional investors so it only makes sense to consider a bank when wondering how to find investors to buy your home. However, most banks do not purchase homes with an investment mindset. Rather, banks usually fund people who are looking to buy homes. Some investors may have funding from a bank for their business so it doesn’t hurt to talk to a banker if you have an established relationship. While the bank may not directly purchase your home they may know a real estate investor who would be interested in working with you. Many cities have real estate investment clubs and San Diego is no different. These clubs bring investors together to network and build partnerships as they grow their investing businesses. As a seller, these meetings may or may not be open to you. It would be a good idea to reach out to someone in a decision making position at a real estate investment club and see if they have special events for sellers to connect with investors or if they have any other suggestions. If these clubs do not welcome real estate pitches from sellers then it may still be wise to attend a meeting just to get a sense of what is being discussed. There could be valuable information that you can use while searching for the right real estate investor for your property. If you are interested in working with an investor then you should work with a real estate agent who understands the process of selling to investors. In many cases these real estate agents will have connections that they can call upon to help further the process along. Some real estate agents who specialize in working with investors will have viewing events similar to open houses where only their real estate investment contacts are invited. This can help drive interest and generate offers. 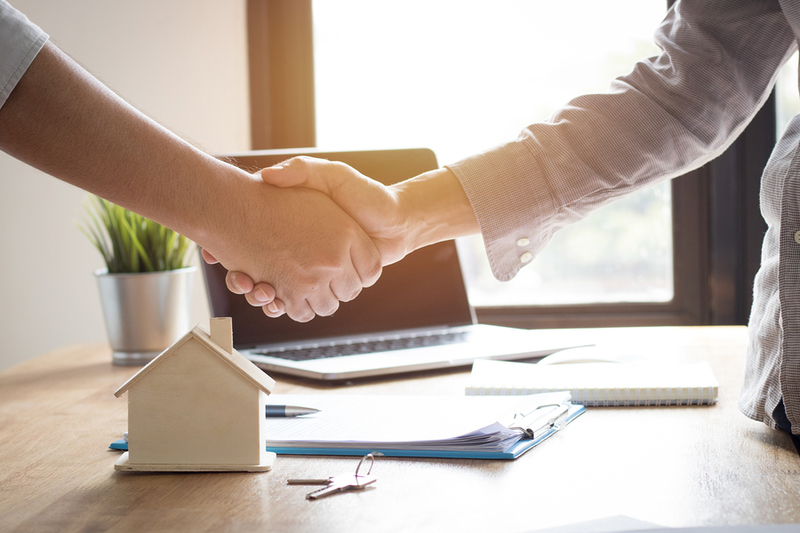 Since working with investors is a unique situation that some sellers may not have experienced before, a real estate agent can also be trusted to walk you through the process. They can advise you about what to expect and how to prepare. In addition to a wealth of experience, real estate agents are able to offer marketing expertise within their vast networks. This may be the extra push that your property needs to find the right investor. One of the best ways to find a real estate investor is to go right to where the money is; the investors themselves. If you want a fast sale – then don’t wait for investors to come to you. Begin contacting real estate investment companies in your area to begin gauging interest in your property. One such company in San Diego is So Cal Home Buyers. They make it easy to get the process started with their web contact form. In addition, their website helps easily explain the process of working with a real estate investment company. Fill out the form on their website or call them, get an offer, and then choose to accept or not. One of the main features shown on the Southern California Homebuyers website is the ability to close in just 7 days. This is ideal for people who are working within a tight timeline and need access to funds quickly. If you’re facing foreclosure, moving, or simply looking to downsize your home and mortgage payment then selling to a real estate investor might be the right choice for you. The internet has made contacting people easier than ever but sometimes there’s still a place for good old fashioned networking. Consider the types of events that you may find real estate investors at and try to make yourself known. Events like foreclosure auctions are great places to meet real estate investors. While this may seem awkward at first you just need to remember that these people are looking for opportunities to invest in real estate. If you have real estate to sell then chances are they would like to get to know you. If you are uncomfortable with attending an event like this on your own, then you may want to ask a friend to go with you. Also, if you are working with a real estate agent then they may know about the upcoming events or auctions and be willing to introduce you to some of their contacts. There are a number of forums and websites dedicated to real estate investing. 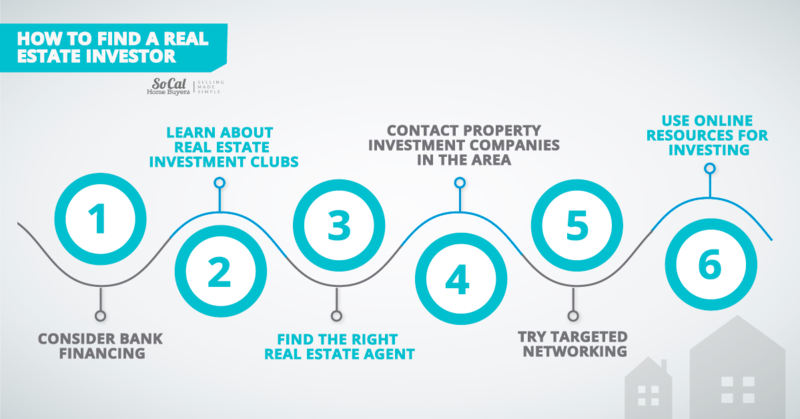 These are all places you can look to if you want to connect with real estate investors. In San Diego there are real estate investment companies like Southern California Homebuyers that can be easily contacted online or by phone. Still, it may be handy to make use of some online resources for research purposes. Some people who live in smaller communities may make use of online resources to find investors from abroad. The internet is a powerful tool and if you are looking to work with a real estate investor then there is an abundance of information available at your fingertips. 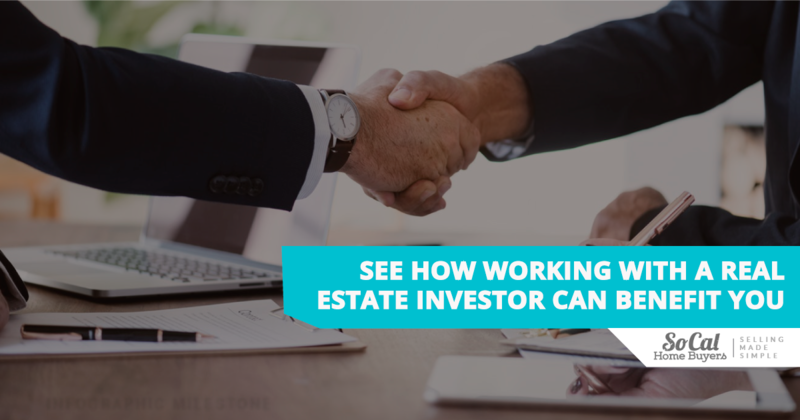 There are a variety of ways to connect with real estate investors. If you are looking to work with someone who can offer you cash for your home as well as a quick closing process then learning how to find investors to buy your home should be very important. Facing foreclosure or being held to a timeline because of moving and other life factors can be stressful. Working with a real estate investor can offer the peace of mind you need to rest easy at night. If you are ever unsure of how to proceed then don’t be afraid to reach out to a trusted expert or consult the online resources available. It’s important to know that you are never alone in this process. Real estate investors are eager to work with you to find a mutually beneficial solution. Reach out to them, tell them your needs, and see how working with a real estate investor can benefit you and your family.